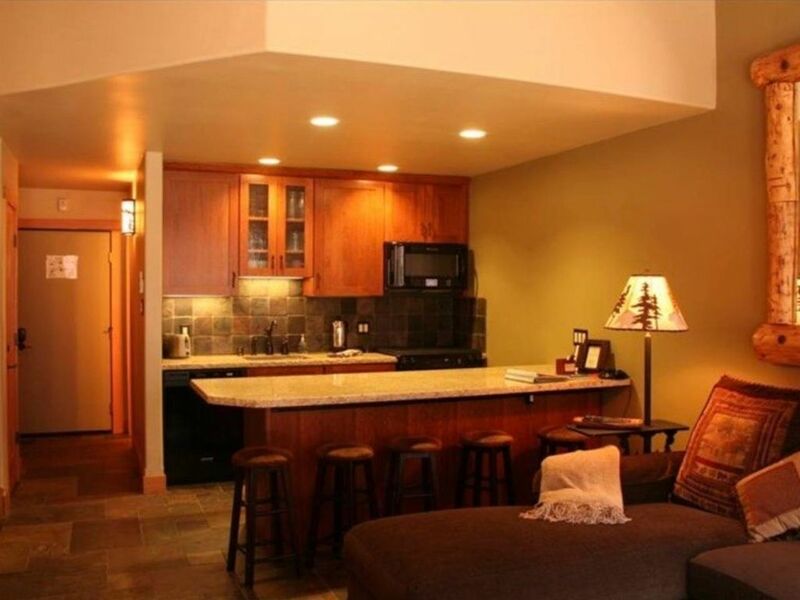 This air conditioned 2 story remodeled ski-in-ski out village condo with bonus loft sleeps 6 in beds. This amazingly situated village condo is perfect for those wanting the proximity to the new village and not wanting to pay the premium price. You will find all the amenities at your front door. Enjoy a great day on the slopes skiing, riding, biking, hiking and much more. Then relax by the cozy fire, enjoy a hot tub, massage, and an amazing dinner in the village. Private master Queen bed +TV. Additional area 2 twins (or King, trundle). A pvt. loft w/ cozy Queen +TV. Plus 2 spacious living room sofas. You will have a full kitchen with all the essential utensils to make home made meals if you choose to stay in. Enjoy the new HD LCD TV in the living area. You will enjoy the full access to the recreation center with state of the art workout facilities, lap pool open year round, family pool, 3 hot tubs, saunas, massage, game room, top 25 tennis resort/camps in the world, and much more. This condo is centrally located in the new village at Northstar and all amenities, shopping, dining, events are conveniently located for your enjoyment. This is a must vacation you will never forget! Newly remodeled luxurious See photos! Ice skating, firepits/smores, shopping, events, music, sushi and much more. This condo is in a perfect location for skiing convenience. It also is well equipped and great for my son and I. Nice property in a great location (walking distance to the gondola, rentals, and ice skating rink). The home has everything you need in the kitchen. Easy parking. Would stay again! The room was just as advertised - sleeps up to 5 or 6, very convenient to skiing, clean and well appointed. Parking is onsite. Our only complaint is that the elevator in the complex was not operational for two of the three days we were there. This is problematic for a third floor unit in transporting skis and for moving luggage. Great trip to Zeke's property. There were no surprises, everything was as advertised. We didn't have to communicate with Zeke since everything was well described from check in to check out. We will stay again. Well maintained, easy access to many area of North Lake Tahoe. Bungee trampoline, tough mudder, iron man competition, Tour de Nez bike race, ice skating, roller skating, retro night, movie night, beer fest, arts and crafts fest, chocolate fest, wine jubilee, pro bike race, top rated ski/snowboard and mountain bike parks in the country and much more!